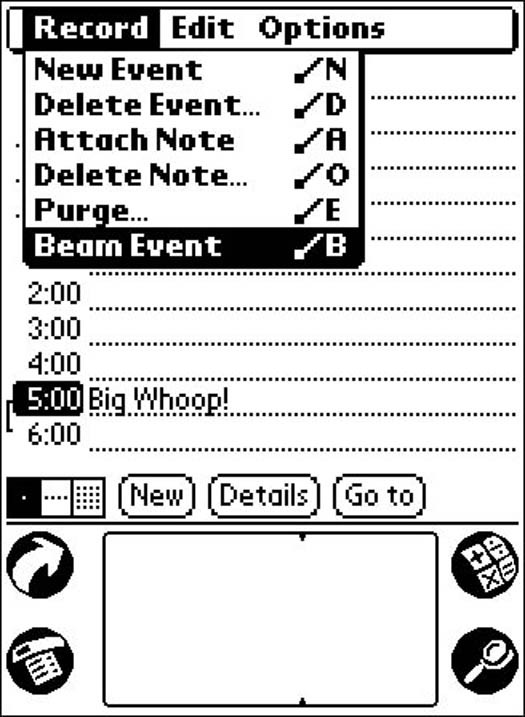 Beaming is a Palm Computing feature that enables you to send information from one Palm device to another by directly pointing the two units at each other. As long as the units are no more than about three feet apart with no obstacles between them, the process is quick and simple. Informal tests show that two Palm devices lose sight of each other when they’re four feet apart, and they also have some trouble communicating if they’re closer than three inches or so. However, at a typical conference table, you should have no trouble beaming information to a Palm device across from you. The Palm beaming feature uses infrared (or IR) light, which is what TV remote controls use. Computer manufacturers include IR communications on laptops and printers. You also can find IR capability on certain pagers and cellular telephones. Not all applications can use the beaming feature. Even the built-in programs, such as Palm Mail and Expense, can’t beam items. But as time goes on, more Palm add-on programs will include a beaming feature. Whenever you beam information between a pair of Palm devices, the data you send remains on your unit and is duplicated on the second unit. Think of the process as sending a fax. Before you send a fax, only you have a copy of the information, and after you’re done, you and the receiver both have a copy (and a week later neither of you can find either copy). 1. Make sure that both Palm devices are turned on and pointed at each other. Keep the two Palm devices within three feet of one another. 2. Select the item you want to beam. The item appears on your screen. You can send a memo, an address, a To Do item, or an appointment. 3. Tap the Menu soft button at the lower-left corner of the Palm screen. 4. From the menu bar, choose Record –> Beam. The menu shows Beam Event for a Date Book appointment (as shown in Figure 1), Beam Address for an Address Book entry, and so on. Figure 1: This event will move through the air. The Beam dialog box opens for a short time, first telling you that it’s preparing to beam and then that it’s searching for another Palm device. After your Palm device finishes beaming the item, the dialog box closes. If all goes well, both Palm devices beep to let you know that the item reached its destination. Your recipient actually knows more about the transfer than you do because dialog boxes pop up on her Palm device to say what the device has received. If the transfer fails, your Palm device displays a message saying something’s wrong and that you should try again. If you enter your own address in your Palm Address Book and mark it as your business card, all you need to do when you want to beam your business card is hold down the Address Book button for about two seconds until the beaming process starts. The two Palm devices should be within three feet of one another. 2. When your friend sends an item to you, wait for the Beam dialog box to open. The Beam dialog box tells you what someone is beaming to you and asks whether you want to accept the item. 3. Tap Yes or No. If you tap No, the Beam dialog box closes, and that’s the end of the process. If you tap Yes, the application to which the beamed item belongs opens and shows you details of the item. For example, if the beamed item is someone’s business card, your Address Book screen appears, showing the new address record that you’re about to add to your Address List. 4. Make any changes you want to the beamed item. You may want to change the category of the item or just make a note about when or where the beamed item originated. For example, if someone beams you her business card at a trade show, you may want to make a note of the trade show at which you met. The item closes, and you see the main screen of the application to which the beamed item belongs.